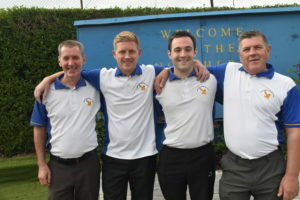 After reaching Ayr on Friday night it was back to the Fours final, weather was kind and the game was played in the right spirit as the ends past away it was nip and tuck all the way with it being peels at 3 – 5 ends. in the 6th end saw Gordon Wilson’s rink take a slender lead to be pulled back to a won shot lead in the 9th even ends till the 14th end when daylight was beginning to show with a five shot lead. 16th end saw a seven shot advantage to the District Fours Winners. leading 16 -9 losing a one in the last it was shake hands time and it now means eleven games undefeated hope it continues till Ayr. Commiseration’s to the rink of Garry Harrison, Ian McDonald, Larry Sorell and Ian Miller.